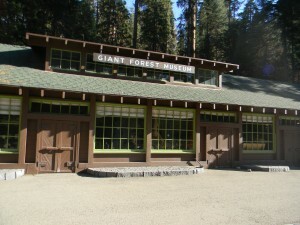 THREE RIVERS, Calif. — Park Ranger Dawn Ryan looked out at the Giant Forest Museum from behind her post at the information desk with a smile. Whether it’s your first time visiting Sequoia National Park or your 15th, the first place to go is the Giant Forest Museum. Providing basic information on the area’s main features, it serves as a starting point for visitors to get a general idea of the giant sequoias before going out to experience them firsthand. 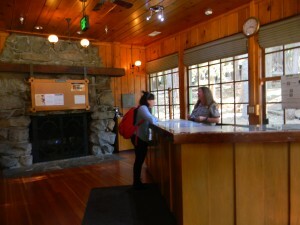 At left, a visitor talks with Ranger Dawn Ryan at the Giant Forest Museum information desk. 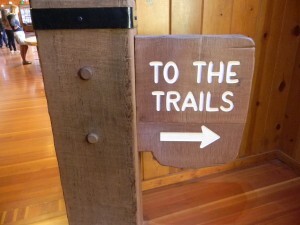 Below, a sign directs visitors to the nearby trails (Photos by Lexi Williams). “The more you know about the park, the more connected you become,” said Ryan. She would know, having been a permanent interpretive ranger for the park for eight years. Ryan not only acts as a tour guide through the different trails around the park; she is also one of the many rangers that take shifts manning the museum’s information desk. Her duties there include selling tickets to guests for different activities and special exhibits offered in the park, providing information about the current park weather and maintenance conditions and answering general questions about the park and its surroundings. However, the museum is more than just a park information center. The interactive exhibits within the 2,700 square foot structure impart knowledge about both the environmental and human cultural aspects of the area. Each display introduces a new facet to the park to give a solid foundation and general overview of the location the visitors are currently exploring. Unlike Lodgepole Visitor Center, another highly popular stop, the Giant Forest Museum is open throughout the winter season and thus attracts visitors who may have otherwise gone to other visitor centers or are simply trying to briefly escape the cold. Together with its connecting system of nearby nature trails, the museum is the perfect “starter kit” for visitors to learn as much about the area as possible. The idea is that visitors come to the museum, look around, ask questions and learn as much as they can, then take a self-guided tour (or, if it’s summertime or weekends, rangers often lead tours free of charge) to the Hazelwood or Round Meadow areas. Otherwise, how would visitors know that the sequoias live so long to be able to grow so tall because of their intricate, widespread root system? Because the Giant Forest is in the very heart of the park and one of the key attractions that draws the most people to Sequoia National Park, it’s no wonder this museum is the busiest visitor center in the park. Located among the Giant Forest Grove, 16 miles from the national park’s entrance at Highway 198, the building— made of wood from Douglas fir, knotty pine and maple trees — is rustic and fits perfectly in its surroundings. 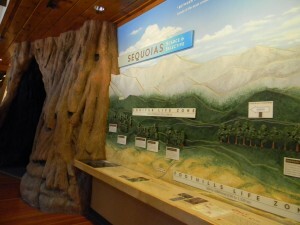 At right, an exhibit in the Giant Forest Museum tells the sequoia story to visitors. Below, the exterior of the museum. Originally built in 1928 as a market, its story contributes to the rich history of Sequoia National Park. The building was in continuous use until 1998 when it was rehabilitated as a museum to coincide with the park’s aim to make the area more nature-centered. The museum finally opened on Dec. 13, 2001 after nearly 20 years of planning and rebuilding. Most visitors cannot help but stop in the museum’s gift shop, which, while small, is one of the busiest spots within the building. There, the standard park assortment of retail is offered, such as maps, stuffed animals, books, postcards and other fun toys and trinkets, many of which could prove to be useful tools throughout the day. On a grand tour of the U.S. West Coast, Megan Millar, from Scotland, was enthralled in the nature preservation exhibit. It is lucky that the museum is the place to go for in-park attraction tickets, so that visitors like Millar get the opportunity to see one of the park’s best resources. Many would not think to include a museum visit in a day (or more) that’s jam-packed with outdoor activities, but for those who do go, it is an invaluable part of the trip. Parking lots located across from facility. No parking or entry fee. Hours: Sundays through Saturdays, 9 a.m. to 6 p.m.